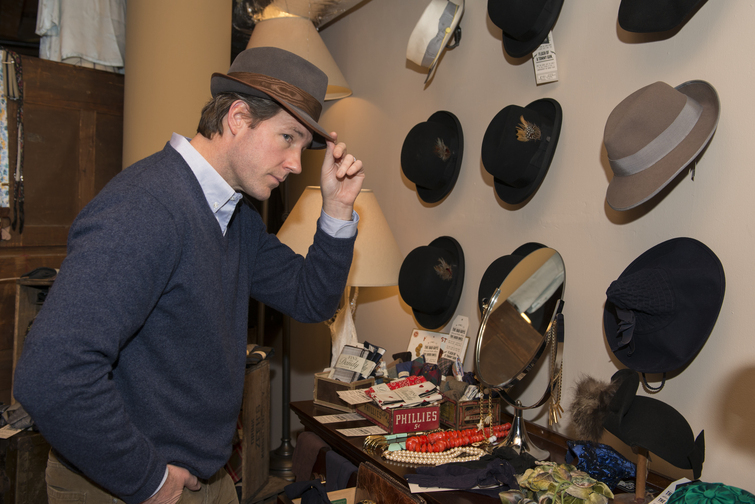 In anticipation for the debut of TNT’s three-week “Mob City” television event from creator Frank Darabont (“The Walking Dead”), the network collaborated with Deutsch NY to open a pop-up haberdashery in New York’s Chelsea Market. Named after key mafia figure Mickey Cohen, Mickey’s Haberdashery offers a clever collection of men’s and women’s vintage and contemporary classic-style apparel and accessories — including hats, pocket squares, ties, cuff links and heritage sunglasses. Visitors can also experience old-time shaves, haircuts and shoe shines. The event attracted “Mob City” stars Ed Burns (who portrays Bugsy Siegel) and Jeremy Like (Mickey Cohen) who surprised first-day customers by dropping by. The 1940’s time-capsule is open only from Dec. 2-4, from 10 a.m. – 8 p.m., giving holiday shoppers a chance to immerse themselves in the “Mob City” atmosphere and buy mobster-style holiday gifts. Few people are aware that notorious gangster Mickey Cohen actually owned various retail operations, including a men’s clothing store called Michael’s Exclusive Haberdashery. He got out of the haberdashery business in 1951, shortly after the IRS started investigating his business dealings. Now, TNT is briefly reviving the store in New York with Mickey’s Haberdashery, where the only shady business is the wide-brimmed vintage hats. Curated by Ignacio Quiles — co-owner of QP & Monty and stylist behind Sartorial Pairings — Mickey’s Haberdashery is selling new and vintage-style apparel and accessories for men and women, as well as books and novelty items. Designer labels include QP & Monty, Victory Collection Optical, Tracy Watt’s Hats, Jack Erwin Shoes, Recipe for Men Skincare, Leisure Life NYC and Miller’s Oath. Based on the critically acclaimed book “L.A. Noir: The Struggle for the Soul of America’s Most Seductive City,” by John Buntin, “Mob City” is set in post-war Los Angeles, home to glamorous movie stars, powerful studio heads and returning war heroes. But it’s also a city caught between a powerful and corrupt police force and an even more dangerous criminal network determined to make L.A. its West Coast base. The epic battle between a determined police chief and a dangerous mobster inflames 1940s Los Angeles in this powerful TNT drama from Frank Darabont who wrote and directed the opening installment and serves as executive producer. “Mob City” stars an exceptional ensemble cast that includes Jon Bernthal (The Walking Dead), Milo Ventimiglia (Heroes), Neal McDonough (Captain America, Desperate Housewives), Alexa Davalos (Clash of the Titans, The Mist), Jeffrey DeMunn (The Walking Dead, The Shawshank Redemption), Gregory Itzin (24), Robert Knepper (Prison Break), Jeremy Luke (Don Jon) and Ed Burns (Entourage). “Mob City” will air in two-hour blocks over three consecutive Wednesdays, December 4, 11 and 18.